ground tracks, mobile base units, main structure, horizontal beam or cantilever and one or multiple trolleys. 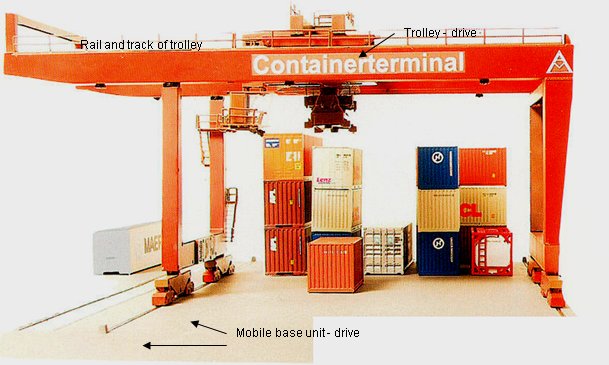 Longer manipulation distances are executed by the mobile base unit, load manipulation is executed by the trolley. 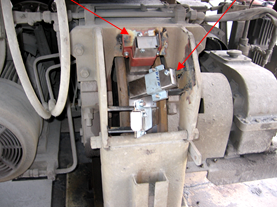 The mobile base unit and the trolley are partly equipped with flange wheels or/and supporting rollers. Those run on trails wich are driven by electric motors. Because of large charges at the contact point between wheel and trail, a lot of friction and wear occur in this applications. Port operations, timber industry, cement-, lime-, gypsum industry, plaster and mortar industry, chemical factories, paper mills, aluminum and steel plants, sugar factories, quarries, raw material industry, etc. 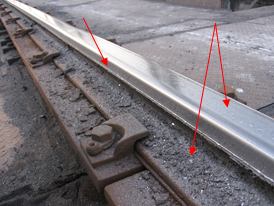 High wear on rails and wheels on the tread or head rail and a loss of friction due to strain hardening of the rail (danger of slipping, unknown braking distance, starting slip, slip-stick effect), high costs and long waiting times for rail repair (welding, grinding, changing), wheel change (trolley is in a height of 30m!!). 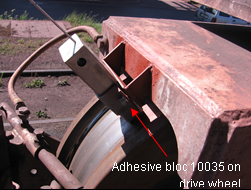 Equipment with adhesive blocks "10035" in mountings "H0030". 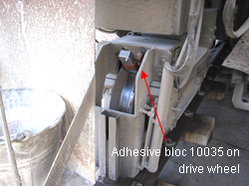 Those coat maintenance-low with adhesive agents to maintain the constant friction between wheel and rail (dynamic coefficient of friction of 0,3-0,5). Simultaneously wheels and trails are protected from wear. The operating life is doubled at least. Convenient side-effects like higher smoothness and freedom from maintenance occur when using wear protective adhesive blocks "10035". Shrinkage of rails on flanks, shrinkage of wheels, tendency of wheels to “climb“ (Wheel flanks seize on rail flanks and climb). High costs and long waiting times for rail repair (welding, grinding, changing), wheel change (trolley is in a height of 30m!!). Equipment of wheel flanges with lubricating blocks "HG045" in mountings "H0020". 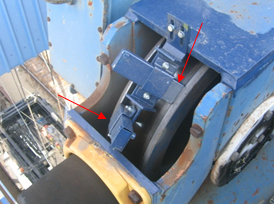 The wheel flanges are maintenance-low coated with dry lubricant. 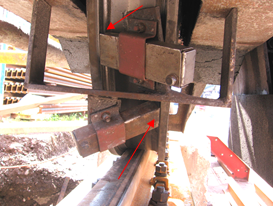 The wheel sets and rails are protected from wear. 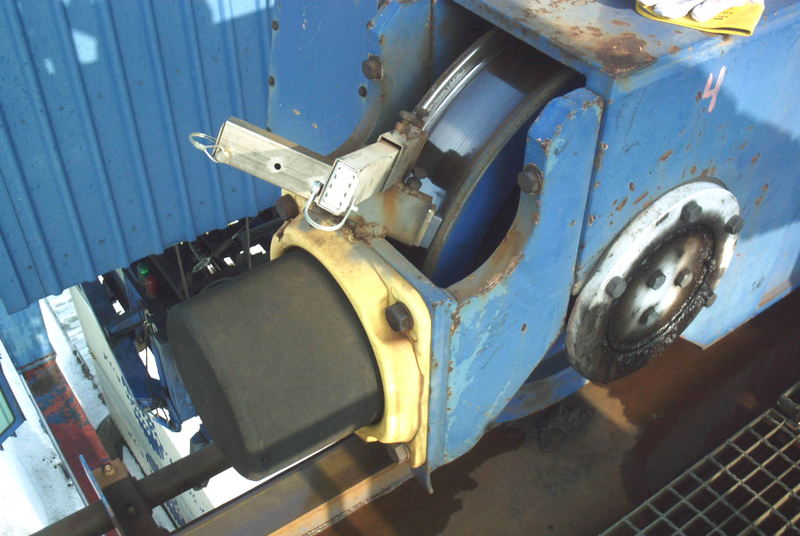 The dangerous ”climbing” of the wheels is prevented by an extremely hard and dry lubricant film. The operating life should double. High time and cost saving because maintenance intervals for wheels and rails are minimized.